Professional esports organization 100Thieves has re-entered the Call of Duty esport scene. 100Thieves announced on Tuesday August 28th, 2018 that they have acquired Kenny and Fero from Team Kaliber. Kenny had a breakout year during Call of Duty World at War 2 as arguably a top 5 player in the game. Boasted by mans as the top sub, and a force to be reckon with. Fero as his team mate also had a great year, and helped Kenny and Team Kaliber to their first tournament win in a couple years. It was no secret that 100Thieves would be re-entering the Call of Duty esports scene. Majority owner Matthew “Nadeshot” Haag gained his large following and and esports presence in the scene with OpTic Gaming. Since the announcement Nadeshot has said it “feels so good to be home” – and that he looks forward to going to the first event of the Black Ops 4 season in Las Vegas in December. 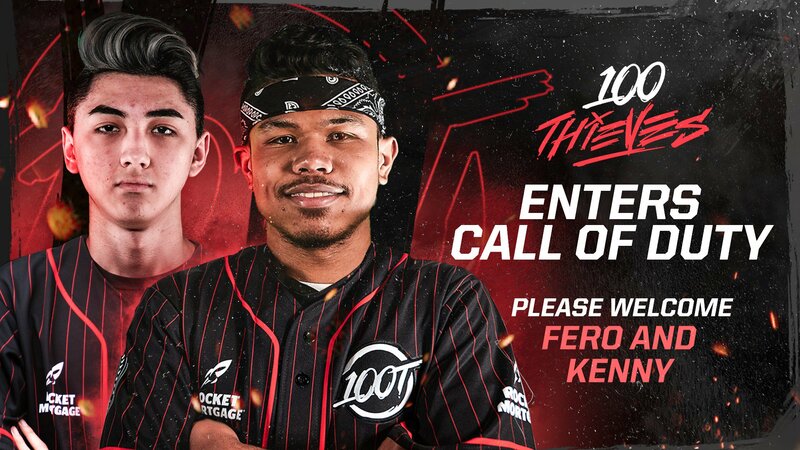 Welcome to the team @100T_KuavoKenny & @100T_Fero.